Many businesses affirm that their entire year’s revenue heavily depends on shopping through Black Friday and Cyber Monday. If you have an online business, this may be an especially profitable time for you, too. If so, you will want to follow these suggestions to make the most of the time left before these all-important days. If your business offers services instead of products, don’t just skip this post. Leverage the following suggestions to promote your services as well. Holiday shopping doesn’t have to be about buying gifts; it can be about booking services and starting new contracts, too. If you are able to create a strong connection to consumers through a set of shared values, your chances of closing sales is greater. There’s no reason not to capitalize on the shop-till-you-drop mentality that is surely present. But you can also remind shoppers to be thankful and reverent during this time of year and spend quality time with family. Start now by making periodic updates providing information about the deals you’ll be offering, and if possible, include visually appealing product images to generate excitement among customers. Don’t forget to start messaging your deals through other marketing channels, including emails, social media, and print. Get consumers interested in your Black Friday/Cyber Monday deals and recommend that they add your site to their shopping list. Remind shoppers of the coming shopping season and get them excited about your deals when they visit your site or engage in your marketing with a Black Friday/Cyber Monday countdown. Place one on the top of your homepage, email, and other marketing platforms. 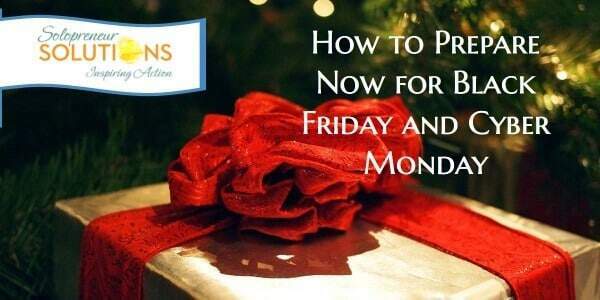 Include “pre-Black Friday/Cyber Monday deals” along with your countdown to increase volume ahead of the big weekend. Many people will make purchases online during Black Friday/Cyber Monday and many of those will be using a mobile phone. In fact, the percentage of customers who use mobile devices for purchasing is increasing every year. Get ready for these shoppers with an attractive and reliable mobile site. Take special care to optimize search, landing pages, and product pages for easy shopping. On Black Friday/Cyber Monday, you need to make it easy for mobile shoppers to not only research products but to actually complete their purchases anywhere, anytime. While many online businesses put all their attention on Cyber Monday, you could be missing out on important sales. Begin your sale the Monday before Cyber Monday and end it on Cyber Monday. Step up your advertising and send multiple emails advertising the sale: one two days before the sale, an email when the sale begins, and then emails on Wednesday, Black Friday, and Cyber Monday. We have all bought that last-minute magazine or candy bar at the grocery store checkout line. Don’t forget to offer incentives for those impulse buyers. Offer a real-time discount for items shoppers viewed but didn’t place in their shopping cart. When shoppers go to check out, your online seller pops up a notification offering 15% off that item that was viewed. This could add enormously to your sales. Black Friday/Cyber Monday means more traffic and shoppers, but it also means a larger number of abandoned shopping carts. Items are placed in a cart, then the shopper halts the shopping experience without purchasing. Email these tepid shoppers with smart abandoned cart emails, perhaps even including a limited time discount on the items in question. If a shopper has made it far enough to add the item to their cart, incentives like free shipping, a product giveaway, or a gift card will often persuade them to make the purchase. Every new customer added to your database by making a purchase should be targeted periodically with offers and news about upcoming promotions. If you have a regular newsletter, add them to this list also for continued engagement. What great ideas do you have for engaging with consumers through Black Friday and Cyber Monday? What ideas have worked well for you in the past? Why not share them with our readers in the comment section below. I dig the idea of using the entire week Donna. When I did more freebies I rarely went with 24 hours. Too many factors where folks did not see and seize it. A week works nicely. Especially because many folks do the week long thingee now. Thanks Ryan, I think a week allows your promotions to actually be seen. There is so much in front of us during the holidays it is easy to get lost.